LOADED 441! ONE OWNER, PREFERRED INBOARD POWER WITH BOW & STERN THRUSTERS, UPGRADED WIRELESS YACHT CONTROLLER! Twin Cummins QCS480 inboard power Upgraded Raymarine system, 2X 12.4" MFD's, open array HD radar, autopilot, DSM 300 depth sounder Black gel coat hull option Full bridge hardtop with2 Zone AC/Heat, wet bar with fridge and full enclosure High glass dark cherry wood upgraded interior Washer/Dryer Under water lights KVH SAT TV Oil change system Every option available, MSRP new was over 900K! The NICEST 441 available! United Yacht Sales New Jersey would love to guide you through a personal showing of this 44' Meridian 441 Sedan 2013. 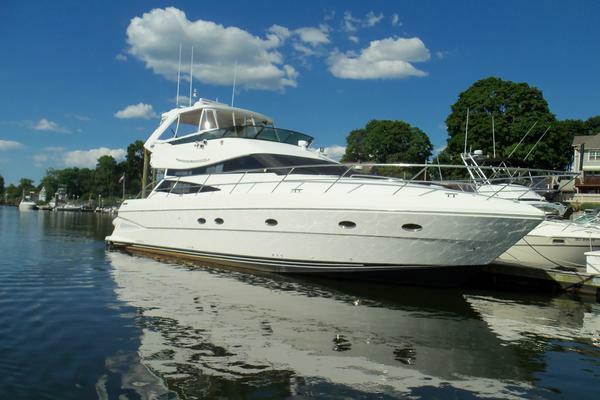 This yacht for sale is located in Hingham, Massachusetts and priced at $539,900. For a showing please contact us by filling out the form on this page and we will get back to you shortly!